Most routes at alaskaiceclimbing.com are considered water ice; however, we have also started to list a few established mixed climbs. Below we have tried to define the range of difficulty for both water ice and mixed routes. Water ice routes typically reform each season as compared to alpine ice which is more consistent from year to year and exist and higher elevations. Water ice ratings are somewhat difficulty to apply to any given route. Because water ice is not a static medium like rock, the conditions of a route are constantly in flux. Depending on the time of season, time of day, or which part of an icefall is climbed the ice conditions can vary from a walkup to being extremely thin. A classic example of variability occurred for T.J. Swann in the winter of '04-'05. Typically, this route consists of a delicate freehanging sicle but during this season the faucet was literally turned on and the route was considerably easier. At alaskaiceclimbing.com, we have only attempted to provide a rating for a route under the most common conditions. In some cases, we have provide a range of difficutly to give a sense of the variability in the route depending on which part is chosen for the ascent. Simply said, you will have to make a first-hand decision as to whether the route is within your ability or not. Typical grades for a pitch of water ice range from 1 to 7 and are abreviated with the WI prefix. WI1 - A walkup where only crampons are necessary to ascend. WI2 - A steeper route with short steps and many rests where a ice tool is needed for the ascent. WI3 - Route is more vertical with longer steep sections. Rests are available and protection is good. WI4 - Good protection is still available on these routes but the route approaches vertical with fewer rests. WI5 - These routes are vertical and tend to be on the apex of difficulty while still retaining good quality in ice and protection. WI6 - Expect steepness throughout the pitch with technical sections. Protection is less often available or requires more creativity. WI7 - Routes in this grade now move in to the dangerous category. Strength and stamina become the norm as the route is vertical to overhanging. Protection is marginal. Mixed climbing is a rather new grading system used to define the difficulty of climbing rock, and possibly some ice, using ice tools and crampons. 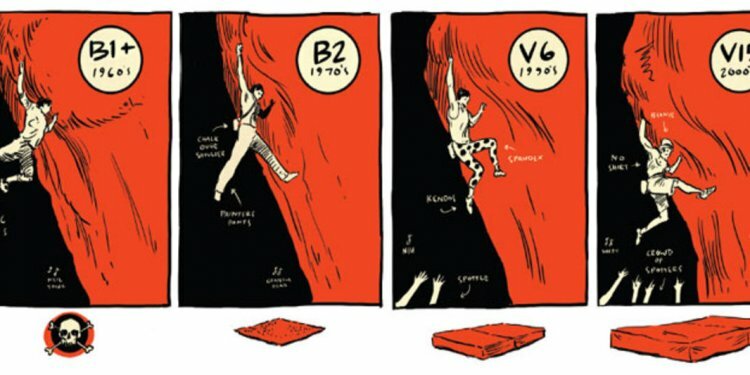 Though not yet set in stone, M grades ("M" given to define a mixed route) are often compared or defined by the difficulty of a similar rock route using the Yosemite Decimal System (YDS).